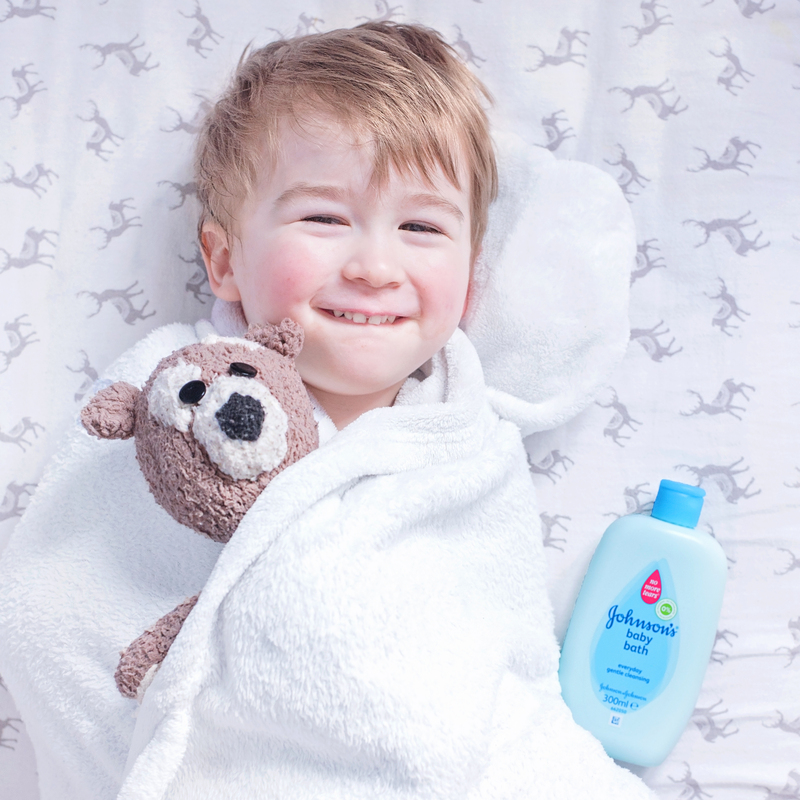 This post is a paid collaboration with Johnson & Johnson as a Johnson’s Baby Ambassador. All of the words and opinions contained in this post are my own. So today, after quite some time of keeping the excitement to myself and my family [who would have wondered where I was sneaking off to unless I’d told them about it], I’m finally, completely and absolutely delighted to be able to announce that this year I’m a part of the Johnson’s Baby Ambassador Academy. Johnson and Johnson are a brand that’s been lovingly used in our family since I was a baby [and embarrassingly also by me as a teenager trying to recreate Shannon Doherty’s perfect and pale complexion on Beverly Hills 90210 by caking my face in Johnson’s Baby Powder], and it was a complete honour and surprise to be chosen to work with them this year on everything exciting that they’re doing in the world of baby care. Last month I was invited to a very special day in London at the Marylebone Hotel to meet with the team and to ask everything I ever wanted to know about Johnson and Johnson’s products – and I came home with a very full notepad and a huge bag of Johnson’s products – which are nearly all empties now as my boys got over excited and treated themselves to a “spa morning” with the Baby Lotion. 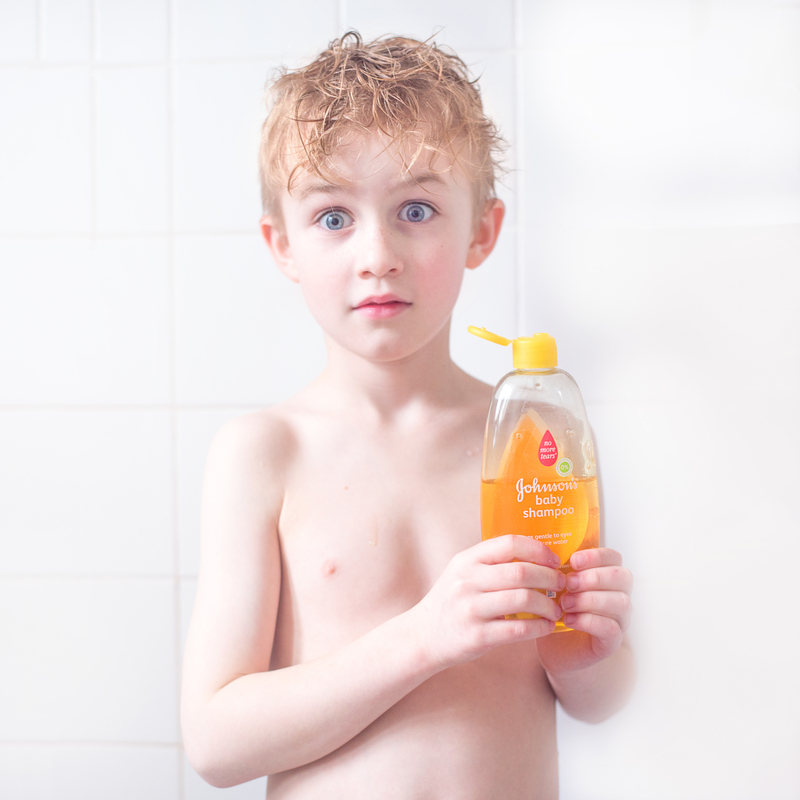 We’ve been terrifically lucky to have worked with some amazing companies over the six and a half years we’ve been in the parent blogging world – but never have I worked with such a transparent brand as Johnson and Johnson – and I don’t say that lightly. I value honesty and integrity above all else when it comes to working relationships, and the Johnson’s team opened every closet door [no skeletons found] and answered every query – no matter how awkward we were about asking it – that any of us had concerning their brand, the media and the reality. They invited experts, people at the very top of their field, and people who have led terrific lives, working with babies all over the world, to speak with us, teach us, and immerse us in the science of baby care. It was a truly awe-inspiring day – and after I woke in the comfiest hotel bed I’ve ever slept in, and without a foot in my face, I returned home beaming. So What Did I Learn so far as a Johnson’s Baby Ambassador? In my new role as a Johnson’s Baby Ambassador, I learned the science about baby skin that I wish I’d known on the day that Jensen was born. 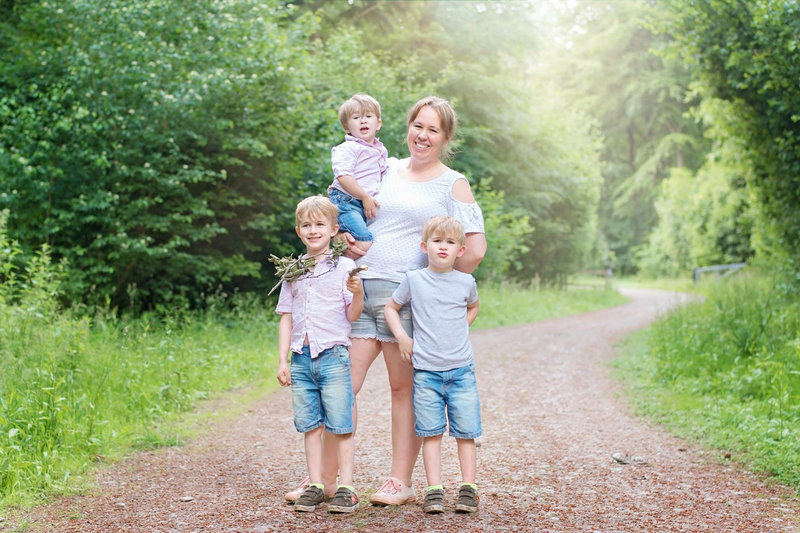 How differently I’d have treated all three of my boys’ skin. Way back in 2010 when I gave birth for the first time, it was after a miscarriage and throughout pregnancy, I’d avoided everything that anyone said would harm my baby in any way if I ate or drank, or put into my body in any way. I was determined from the moment I saw his little heartbeat on the monitor. Nothing that was going to harm him would touch him if I could help it. I gave birth naturally without painkillers [that hurt, alot] and from the moment he was handed to me, I wanted to keep him as pure as I possibly could. His clothes were all cotton, his nappies were cloth, and I left him unbathed until his umbilical cord fell off and frightened the life out of me because it was knocked off by his enormous nappy and looked like something from a horror film. When I asked what to wash him in, the advice was water and cotton wool, and that I should leave anything “chemical” for at least six months. And I did. I bought bag upon bag of teeny little cotton wool balls and carried warm, purified water in my bag wherever I went – and I’ll be quite honest that I was pretty disgusted at any of my friends who were using baby wipes by day five of their baby’s lives. I couldn’t understand why they’d put all those “chemicals” on their baby’s precious skin. Johnson & Johnson were the first company to study how baby’s skin develops from birth, helping and have helped to advance 90% of publications & peer-reviewed scientific literature on the subject of baby skin. They studied babies all over the world, discovering that a baby’s pH & moisturisation needs are vastly different from ours as their parents, as baby skin is 30% thinner at birth than a grown adult’s. They also found that it has less natural moisturising factors in it and loses water far more easily, which means that our baby’s skin is very often dry without us noticing. So, I learned that if I’m experiencing dry skin because of weather or the atmosphere in my surroundings, then my baby’s skin is already much more dehydrated than mine. Imagine leaving a grape and a segment of orange out on the table. The grape represents adult skin and the orange is baby skin. Leave them both for an hour and come back. Feel them both. The grape is still as before – but the poor baby orange is all dried up. And I don’t know about you, but I’m not a happy bunny when my skin is dry. In fact, I’m a very unhappy, snappy one. So, what do we do? 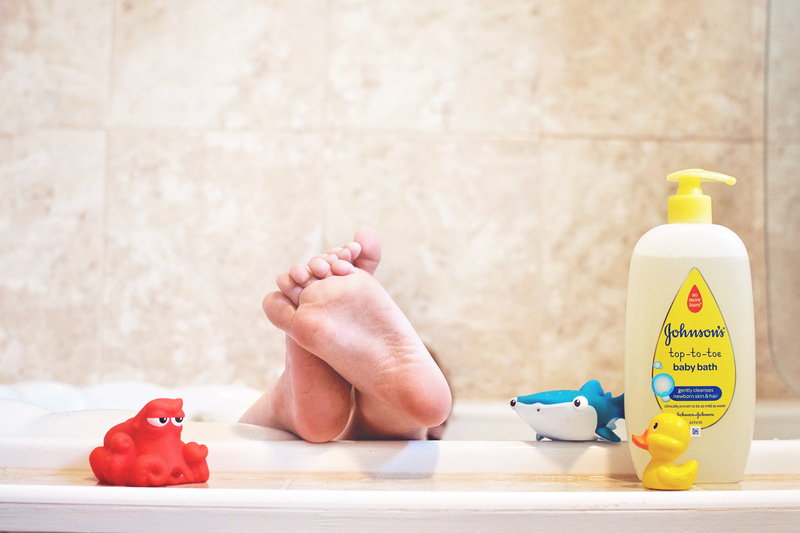 Every morning and night, I put lotion on my face, hands and feet…and so do my boys. They love having their feet moisturised and sit together like a little spa group, giggling and squishing Johnson’s Baby Lotion between their toes, and, well, EVERYWHERE. Hero now asks to be massaged which makes the older two laugh hysterically at him, but he doesn’t care as he lies there having his little body pampered and falls asleep happy and relaxed. When the boys were little I used to stroke their legs when they’d hurt themselves falling over and both me and Gav would say occasionally ask each other if we’d noticed that their legs were dry and whether it might be that it was from wearing shorts all of the time [a family trait] – and overexposing them to the elements – and now I know it’s because their skin is so much different to ours. It’s not just babies’ skin, but also their eyes which are different to ours. One of my favourite childhood bath products was the No More Tears Shampoo. I loved seeing the clear, squishy bottle at bathtime and the smell is something I instantly recall as soon as someone mentions it. However, I had NO idea about the No More Tears formula itself and why it came about. I thought it was simply that Johnson & Johnson had found a formula that made eyes sting less because as children on the whole, me and my sister made an almighty fuss about having our hair washed and always managed to get shampoo in our eyes because we were convinced with every jug of water my mom poured over the back of our heads, that we were drowning, and we flapped about ridiculously, gasping and reaching for our vests on the side of the bath to cover our eyes. The real reason that the No More Tears formula was developed was much more scientific [although I’m very grateful however it came about – and that my mom bought it for us]. You see, whereas we blink quite a bit – between 15-20 times a minute according to research, babies only blink on average 2-3 times a minute, and this is because their blinking, tearing and defensive eye closure function needs to develop. This is why they’ll always beat you at staring contests, and also why they are more prone to being poked in the eyeball by a well-meaning bigger brother or sister, too. I also learned a new word for myself whilst I was taking everything on board. Chemophobia; a fear of chemicals, or more accurately in my case, I had a [rather irrational, it turns out] fear of chemicals coming into contact with my children. As I said earlier, when my first baby was born, I was terrified to use anything other than the recommended water and cotton wool on my baby’s skin. I was horrified that my friends were using baby wipes and plastering their children with all of these, well, chemicals – and some of them seemed scarier than others, and kept popping up in the news. There were stories of chemicals allegedly causing harm to individuals in the very products that were supposed to protect them, and I buried my head, feeling pleased that I only used water, and I stayed ignorant for quite some time. I heard “formaldehyde” and “parabens” and didn’t like the sound of either – although I didn’t really know anything about either. The chances are you’ll hear the word formaldehyde and think of embalming, and death. I know I did. I’m no scientist and the only time I’d heard this chemical mentioned before was in talks of funerals and mummies when I was teaching about Egypt. 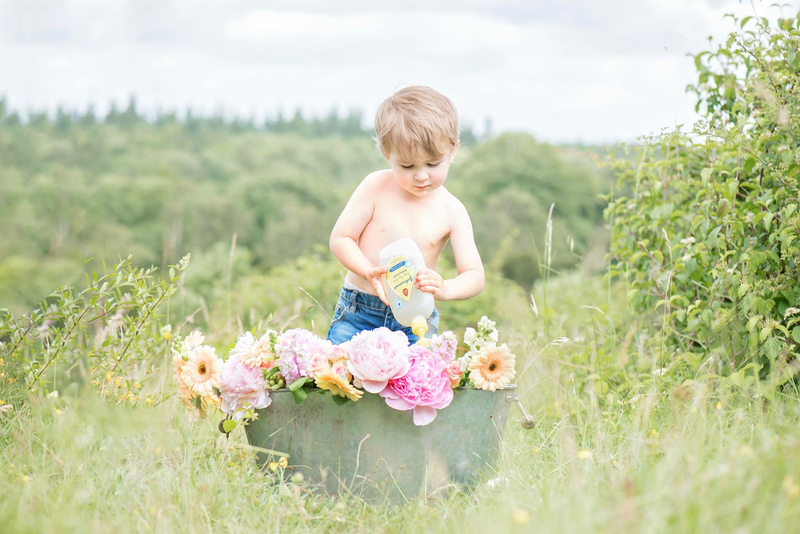 Naturally, as a mom, formaldehyde sounded like something I really wouldn’t want my babies to be anywhere near – formaldehyde was also linked with Cancer in the media and hearing the chemical then apparently was somehow involved with my favourite baby care brand, I began to worry. Yet despite being an academic – and a lawyer to boot – I somehow didn’t think to actually check the facts myself. So it was with great relief that as a Johnson & Johnson Ambassador, I spent a fantastic day with David Mays, Senior Director of Global Scientific Engagement for Johnson & Johnson, learning about the science of skin, and putting my mind at ease. I lost count of the questions I asked, but if you know me, you know I’m not afraid to raise my hand and speak. There are no stupid questions when it comes to your babies’ healthcare. It turns out that Formaldehyde isn’t what I thought – it’s a simple chemical compound consisting of carbon, hydrogen and oxygen. In its purest form, it’s a gas which is naturally produced in humans and animals as a part of cell metabolism. It also occurs naturally in common fruits and vegetables, meat and shellfish (even organic ones). It’s nature’s preservative and the fears that most of us have are based on health issues which have occurred when us humans have encountered an immense and consistent exposure to the chemical. Nonetheless, fears aside, Johnson’s Baby products do not contain formaldehyde. There was so much that I learned, and I have so much to talk about, but I’m going to stop here for now as it’s actually bathtime in our home and I have three boys fighting over which bubble bath and shampoo to use – the only thing we’re all decided on so far, is that for us in the Jones Household, it has to be Johnson’s Baby.